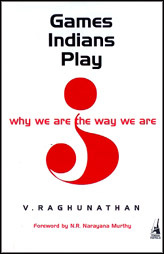 V R’s book is indeed very interesting and holds up a mirror to all Indians. I only hope that many would read it. The message in the book is simple. Indians have double standards. We expect the other guy to be ethical but we can be unethical if it serves our individual purposes. One sees this in actual life all the time. Morals? What yuga are you living in my young friend? Uncleji you are right, the book shows mirror to us. However, I think on a macro level the same is happening in other countries too. The Moral Hazard the world of economists is talking about similar case as book describes for Indians – levels are different, scales are different.